McDonald's is situated in an ideal spot in Meir Park on Lysander Road, 4.39 miles south-east of the centre of Stoke-On-Trent, in Blythe Bridge (next to Blythe Bridge Bypass Roundabout of A50). This restaurant is situated properly to serve those from the areas of Meir, Caverswall, Weston Coyney, Stallington, Forsbrook, Lightwood, Meir Heath and Normacot. If you plan to visit today (Monday), its hours of business are 24 hours. On this page, you will find information about McDonald's Meir Park, Stoke-On-Trent, including the operating times, directions and phone details. McDonald's is situated in an ideal spot near the crossroads of Farnborough Drive and Lysander Road, in Blythe Bridge, Stoke-On-Trent, at Meir Park. Merely a 1 minute drive time from Mickleby Way, Freckleton Place, Uttoxeter Road or Glaisher Drive; a 4 minute drive from Meir Tunnel of A50, Utoxeter Road and Uttoxter Road; or a 11 minute drive time from A50 / Meir Tunnel or Sandon Road. Users of GPS should use the postcode ST3 7WA or navigate button. Frequent bus services run to and from Allan House, Catchems Corner, Greenacres Avenue and Tesco Roundabout. If you are arriving by train, you can disembark at Blythe Bridge Station (5010 ft) and Longton Station (2.78 mi away). Line that stops here: East Midlands Trains. This restaurant is a short distance by foot to Copelands Tours, Springcroft Primary School, Creda Golf Club, Meir Waterworks, Hadleigh Park and Saint Clare's Church. The total number of McDonald's branches currently open in Stoke-On-Trent, Staffordshire is 4. 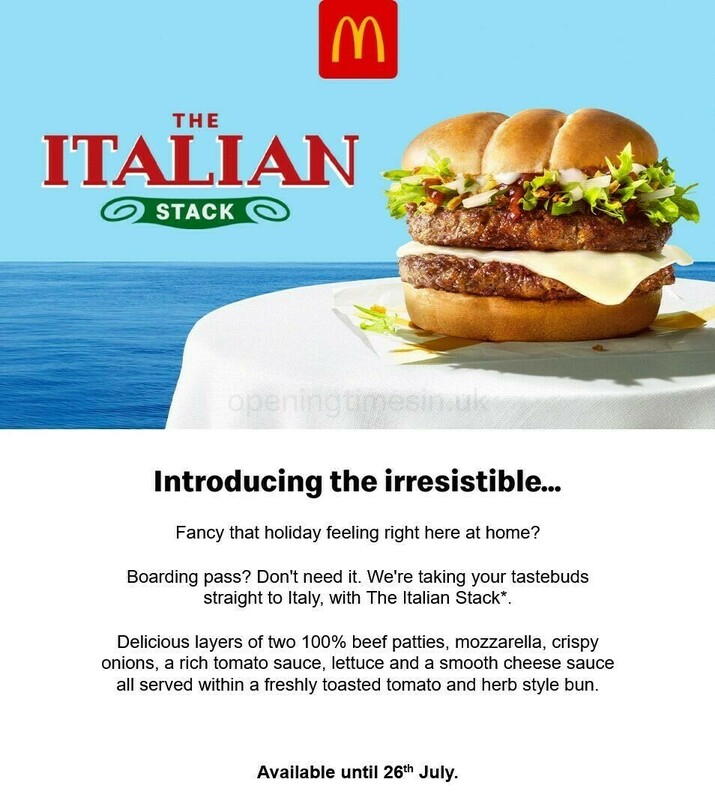 For the full list of all McDonald's restaurants near Stoke-On-Trent, visit the page provided. Please note, regular hours of opening for McDonald's in Meir Park, Stoke-On-Trent may change during the holiday season. Throughout 2019 these revisions consist of Christmas, New Year's Day, Good Friday or Early May Bank Holiday. The best way to get specific details about seasonal open hours for McDonald's Meir Park, Stoke-On-Trent is to go to the official homepage, or phone the customer service line at 370 524 4622. Visit Meir Park today for a wide collection of excellent stores and great offers. In this place you'll also find TESCO, McDonald's and a few others. Help our team keep the information as up to date as possible. Please don’t hesitate to make use of this form to report any mistakes with the place of business info or hours of business for McDonald's in Meir Park, Stoke-On-Trent. Using the space provided below, you are welcome to state your critique of McDonald's, and rate the location using the star system.